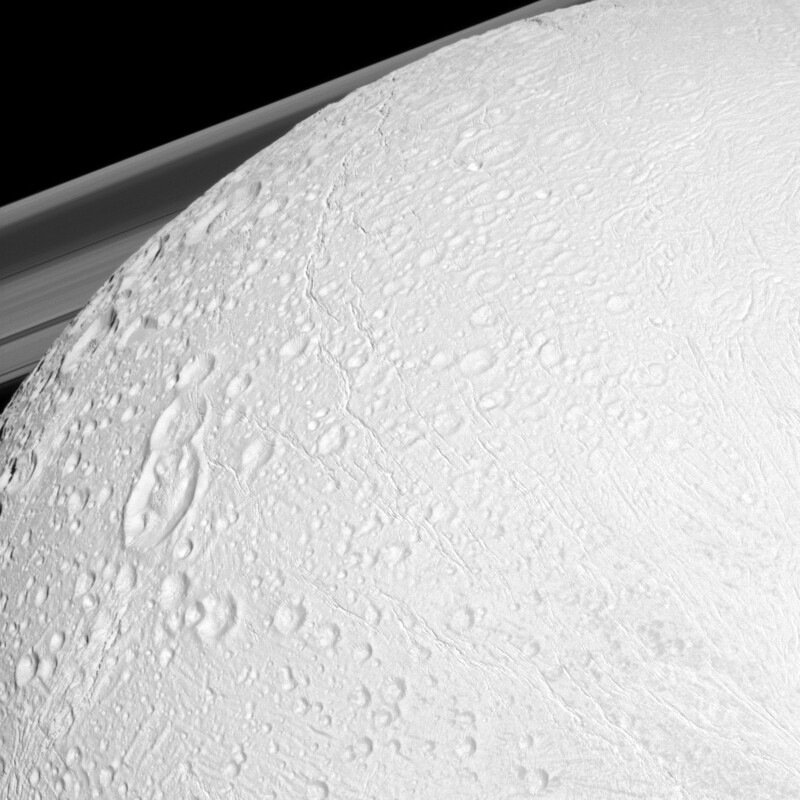 Cassini gets a nice look at Enceladus’ icy, cratered north pole in this image, taken on December 21, 2010. In the background we catch a glimpse of Saturn’s rings as well! Fantastic image. The Cassini spacecraft was about 20,000 miles (34000 km) from Enceladus when this was taken, using its narrow-angle camera. 318 miles across at its widest point, Enceladus’ wrinkled surface is composed mostly of water ice that has been cracked, stretched and folded into ridges due to tectonic activity that may be the result of a liquid water interior. Without a doubt the water is there – it’s being actively sprayed out into space through fissures in the moon’s south pole! – but the volume and heat source of that liquid water still remains to be discovered. 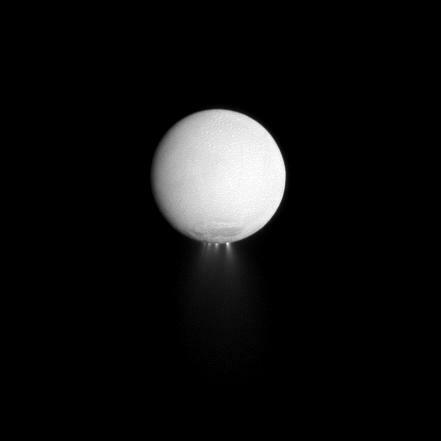 Being covered in ice makes Enceladus is extremely bright; it reflects nearly 100% of the sunlight that hits it. This also keeps the moon very cold…the surface temperature on Enceladus is minus 330º F! Still, some process is keeping parts of the moon warm enough for liquid water to exist, and this is what scientists on the Cassini team are still trying to learn more about. In fact, recent discoveries have found that the southern region of Enceladus – where the jets are – is generating much more heat and energy than previously expected…well over twice the amount put out by all of the geysers in Yellowstone National Park! This is quite a surprising find on an icy little moon out in the frigid region of space around Saturn. And, of course, where we find liquid water and heat we may also find the possibility of life…and this is exactly why scientists are now so intrigued by Enceladus! Previous Post Five Years of High-Resolution Exploration!